One of the great things about stair lifts is all the available options. There are many different makes and models. After you’ve made the decision to invest in a stair lift, the next big decision is, what kind of stair lift do you want? There are straight stair lifts and curved stair lifts. You can find stair lifts that are electric and ones that are battery-powered. There are stair lifts that are designed specifically for outdoor use. Size also needs to be considered when choosing a stair lift. If the stair lift is going to be used primarily by a large person, large stair lifts are available and will likely be the best option. This is why it’s important to know the weight capacity of a stair lift. 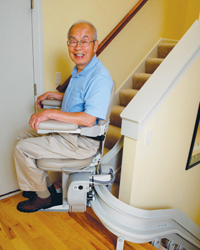 If height is a factor, the stair lift’s seat height can often be raised during installation. You want to choose a stair lift that will accommodate everyone that will be using the lift. Remember, a large stair lift can still carry a smaller person. It doesn’t work the other way around. If you feel you need a large chair lift, look for lifts with over-sized chairs and high weight capacity. Indy Stair Lifts features the Indy XL Stair Lift. This lift has the heaviest carrying capacity in the stair lift industry. The Indy XL Stair Lift has a weight capacity of up to 500 lbs. It is made with heavy-duty materials designed to support any body size or type. It also comes with a safety switch that stops the stair lift from functioning when the lift is not in the correct position.